October 16, 2013 – A Servisair ground services employee, Dicarlo Bennett, 28, was arrested last night in connection to dry ice explosions at Los Angeles International Airport (LAX). 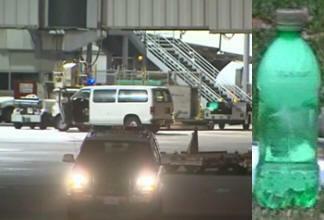 The arrest comes after two incidents that took place on Sunday and Monday at the airport. Los Angeles Airport Police Chief Patrick Gannon said "Police can confirm the arrest of a single suspect related to the two dry ice incidents at Los Angeles International Airport". Gannon further stated "We want to reassure the traveling public, visitors and employees that LAX is safe and secure". On Sunday about 7 PM a 20 once plastic bottle filled with dry ice exploded in terminal 2 in an employee only restroom. Operations at the terminal were suspended while Los Angeles Police Department (LAPD) bomb squad cleared the area. On Monday at about 8:30 PM an LAX employee walked upon a plastic bottle that was fizzing on the tarmac at Tom Bradley International Terminal. LAPD was called in and secured the area. The plastic bottle filled with dry ice had not exploded. The same employee reported that he had spotted a similar device on Sunday but did not realize what it was. Police focused their attention onto airport employees as both bombs were located in secure areas not accessible to the public. LAX airport spokeswoman Nancy Suey Castles said “to get access to where the dry ice explosions occurred you would need an employee badge”. Bennett is being held on a $1 million bond and faces a charge of possession of explosive or destructive devices at an airport and near an aircraft. LAPD Deputy Chief Michael Downing who heads the department's counter terrorism and special operations bureau said anyone of the 20 once plastic bottles containing dry ice could have cause serious injury to anyone in close proximity. Law enforcement report that a total of four devices were found and two of them went off. It is unclear to Bennett’s motives however, Chief Downing does not feel these acts were related to terrorism and speculates that Bennett was a disgruntled employee and his acts were related to a labor dispute.